More animation coming to comics! The Amazing World of Gumball is of course a popular Cartoon Network series created by Ben Bocquelet. 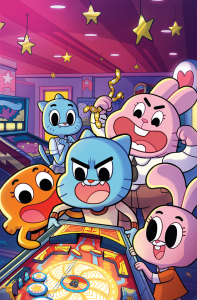 It brings us the adventures of Gumball, a young blue cat, along with his younger sister Anais, a pink rabbit, and his younger brother Darwin, a goldfish. (Hey look, it’s cartoons! It make sense, okay? Trust us!). Now Boom! Studios have brought Gumball to the world of comics through their Kaboom! imprint. The new series is written by Frank Gibson (Adventure Time) with full-color multi-media art by Tyson Hesse (Bravest Warriors). Of course Kaboom! has a write up on the whole thing.